I lived in Ivymeath House, 284 Maidstone Road, Chatham from when I was born in 1928 until 1953. Peter Harvey, who was a scout master for the Mathematical School 2nd Medway Scouts, lived opposite us and as I went to that school I joined the scout troop in 1941; I can remember the date as Lord Baden Powell died about a month before I joined. Mr Judd, who was a founder member of the scout troop used to come to the school every Thursday in his full scout uniform, including his campaign hat! We went to Knights Place Farm for Whitsun scout camp every year and stayed in The Upper Floor of an Oast House that belonged to Mr Sedgwick, the farm owner. One of my memories is that it was quite cold! Adjacent to the Oast House was 4 acre field that sloped downwards, in a north westerly direction, to the edge of the Darnley Estate. There was an iron barred fence round the estate, we walked towards the fence and went onto the estate through a gate in the fence. We had to pass an ‘Axemanship Test’, which was in two parts, 2nd & 1st class badge tests. The 2nd class was the use and safety of a knife and the 1st class was using a felling axe to cut up logs and fell any dead or diseased trees, for which the scoutmaster had to take us into the woods. We were taken to see the ‘toe monument’ (this was a monument erected to mark the death of the 5th Earl of Darnley who died on the 11th February 1835 due to an accident with an axe) and told the story of how he died so that we were more aware of the dangers of using an axe and that septicaemia could kill you. The local story is that the Earl was out in the woods and he saw one of the woodsmen using his axe in an unsafe manner and demanded his axe so that he could show him how it should be done, the result was that he chopped off his toe and died of tetanus four days later. Whether this is true or not has not been established. We also played games on these camps, one of which was ‘Flag Raid’. There were two teams and each team had different colour wool wound round their arms and the object was to capture the flag by creeping and crawling to remain undetected. If you were caught the wool was stripped from your arm and you were ‘dead’. We had to collect the dead wood to make our camp fire; this was not only to keep us warm but was also used for cooking our meals. We also did night hikes into the park to the mausoleum, which was very creepy as you can imagine with a group of teenage boys. I don’ know why but I have a vivid memory of a tree, about 20 feet tall, growing out of the pointed dome roof, it was in a very poor and dilapidated condition and I am pleased that it has now been restored. 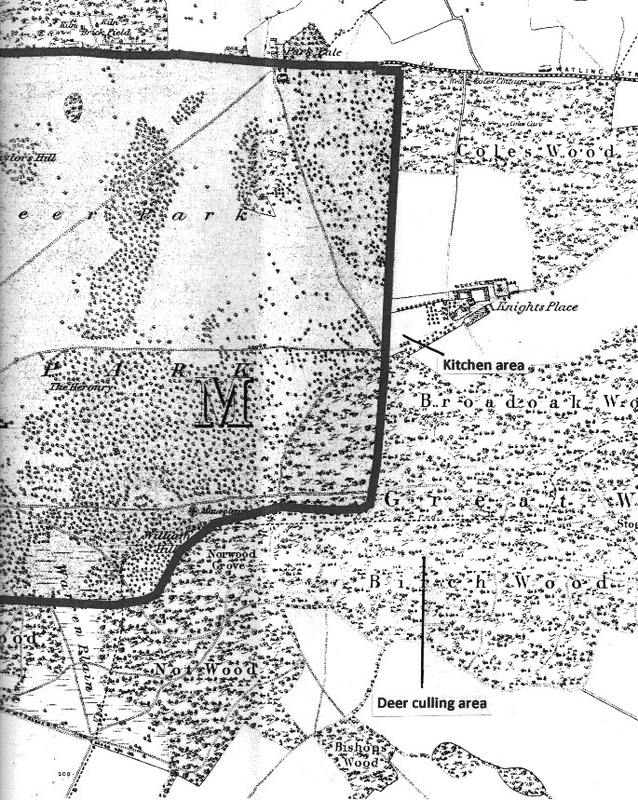 Map showing the eastern boundary of Cobham Park, the scout camp kitchen area and the deer culling area. When I was 17, just before I joined the marines, a friend of mine, Peter Auger, invited me to be a beater for a deer cull that was going to take place. The deer were escaping from the park and getting into the arable land. I don’t know whether this was because the deer were jumping the fence or that the fence had fallen into disrepair but anyway, they were escaping. There were about six guns on the day. I didn’t enjoy seeing the deer being shot as we flushed them out so I never went back to another cull. The above map shows where the deer cull took place. In 1950, after I had completed my National Service with the Royal Marines the previous year, we would catch a bus to Reed Court, walk along the track to Knights Place farm, through the Darnley Estate and into Cobham where we would go into the tea shop before returning home. Not really pertinent to Cobham but interesting local history. In 1949 I tried to get into agricultural college but there was a very long waiting list so I went to work, as a labourer, for my father in his Lime business at Bluebell Hill. Agricultural lime was very much in demand to get the soil back to fertility, quicklime, on the other hand, was an expensive commodity and despite generous government subsidies had fallen in demand. The subsidies were as high as 60% to 70% depending on the time of year. 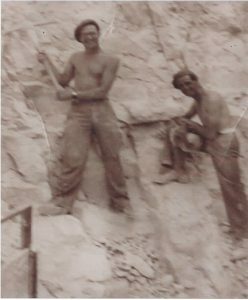 At the time the chalk had to be excavated with pick axes and it was obvious that the business needed to invest in new machinery. (See photograph below). To illustrate the lack of Health & Safety in the workplace, to say nothing of National security, I used to visit the local gunsmiths, Sanders, who had a shop at the back of Maidstone Town Hall, in order to purchase gunpowder, detonators and fuse wire. The detonators were kept in a small tobacco tin, which also contained sawdust to keep the detonators apart so that there was no chance of any contact, which could have caused problems. My father, the senior partner, eventually realised that the days of quicklime were coming to a close and we invested in machinery, in order to produce the more popular Agricultural Lime (which was screened & processed chalk). (Quicklime was also known as burnt lime). In 1970 the lime workings came to an abrupt halt. The KCC needed a new by pass to solve the traffic problems occurring in the village of Bluebell Hill, their chosen route was right through the centre of our quarry and was compulsory purchased by KCC . I was 44 years old, I had Lorries and spreading machinery, with nothing to haul or spread. Eventually I managed to open another quarry at Detling and there I remained until my retirement in 1998. The photograph below, although not top quality, shows myself on the right and ‘Bunny’Austen on the left, with pickaxe poised for action on the face of the chalk quarry. His nickname ‘Bunny’ was after the famous British tennis player of the mid to late 30’s. This entry was posted in Oral History and tagged Cobham Landscape Detectives, environmental, social history. Bookmark the permalink.